The Google Home Mini smart speaker, pictured above, may now be used as a Bluetooth speaker due to firmware and Google Home app updates in the last few years. In this article, we show how to use your tablet or phone to drive this speaker via Bluetooth. You indeed can send audio to the Mini, for room-filling, shockingly awesome sounding audio, given how small the Google Home Mini is. We’d like to use (pair) the Google Home Mini smart speaker to an iPad Air tablet. In this scenario, the Mini becomes a Bluetooth speaker. This allows us to play any audio that the iPad can play, through the Mini. You might wish this if you’re watching a Netflix movie or playing your Alexa music library on your iPhone, but want louder, and over all better sound than what you get from the phone speakers. Make sure that both your tablet and your Google Home Mini are online and connected to the internet. Enable Bluetooth on the source device that you’re pairing with the Google Mini. In our case, we’re pairing from an iPad Air. Then, and assure that you see the “Now discoverable as” message, as shown next. How to use Google Home Mini as Bluetooth Speaker: iPad Bluetooth Discovery Mode Screen, showing Bluetooth is ON. On my iPad, this app appears on the third home page, as pictured next. 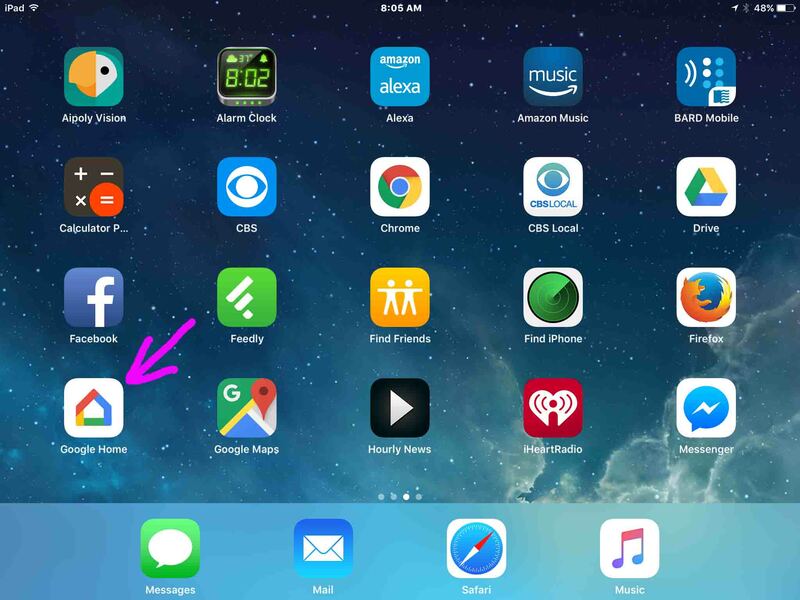 How to use Google Home Mini as Bluetooth Speaker: Google Home App entry, as shown on the iOS home screen. The Google Home app home screen then displays, as pictured next. How to use Google Home Mini as Bluetooth Speaker: Google Home app on iOS, displaying its home screen, with the hamburger menu control highlighted. Find the hamburger menu control near the top left corner of the Google Home app home screen. Tapping that control brings up the main menu window, as shown next. How to use Google Home Mini as Bluetooth Speaker: Google Home App 2017, showing the Home screen with Devices menu item highlighted. This brings up the list of Google Home devices that the app knows about, as shown next. Google Home Mini Speaker, as displayed in the Google Home App, showing in the Devices list, with its Device Menu location highlighted. Find the control menu (hamburger) item pointed at by the purple arrow in the last picture. Tapping this control causes the speaker device control menu to open, as shown in the next picture. Google Home Mini smart speaker, as displayed in the Google Home App, with its Settings menu item circled. Find the Settings item in the hamburger menu as displayed in the previous picture, with the purple circle around it. You then see the Device Settings screen for the specific Google Home Mini speaker device displayed on the previous screen. This speaker’s specific setting options are shown on the screen shown next. In our case, that device is named Office Speaker. Note that we’ve scrolled down to the Device Settings section on this screen to find the Paired Bluetooth Devices option, as circled in the next picture. How to use Google Home Mini as Bluetooth Speaker: Google Home App 2017, showing the Device Settings screen with the Paired Bluetooth Devices option highlighted. Find the Paired Bluetooth Devices option circled in the previous picture. Then, the Paired Bluetooth Devices screen then appears as shown next, where we could select a Bluetooth device from a list of devices that we’ve previously paired with, had we ever paired with any before. But since we have not, the screen is almost entirely blank. This puts the Google Home device we’re working with into Bluetooth discovery mode. That is, it will now show up when other in-range devices scan for Bluetooth Devices. Confirmation of this is shown by a black bar momentarily appearing at the bottom of the Paired Bluetooth Devices screen, as shown next. Google Home App 2017, displaying the Paired Bluetooth Devices screen, showing the Ready To Pair message highlighted. How to use Google Home Mini as Bluetooth Speaker. 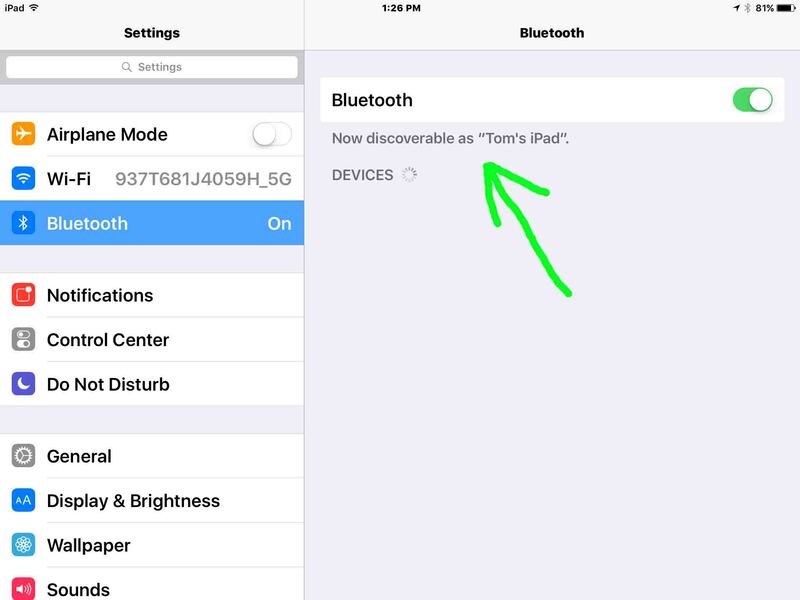 Find Bluetooth Settings somewhere in the Settings app on your phone or tablet. On our iPad Air, we hit the home button, tapped the Settings app, and then tapped Bluetooth on the left side of the screen, to reveal the following screen. iOS Bluetooth Found Devices list, showing our Google Home Mini speaker, that is named Office Speaker, circled. In our case here, we wish to pair theOffice Speaker Google Home Mini device, as circled above. Then, if all goes well, your Google Mini plays a short burst of musical chord, and pairing then occurs. Your paired device then moves up from the Other Devices list to My Devices if you’re using pairing with an iOS device, as shown next for our case; the purple circled Office Speaker device. iOS Bluetooth Found Devices list, showing Google Home Mini Office Speaker, successfully paired. There, you’ll now find that the Google Home App has added the source device (your phone or tablet) to its Known Bluetooth Devices list for your Google Home Mini speaker, as we show in the next picture. Our pairing source device is called Tom’s iPad. Google Home App 2017, displaying its Paired Bluetooth Devices history screen, showing our Tom’s iPad device as having paired with the Google Home speaker. At this point, all your tablet’s generated sounds would play on your Google Home Mini smart speaker, which is now acting as a full fledged Bluetooth speaker. Pairing is complete. To stop using your Google Home Mini as a Bluetooth speaker, you would unpair it from a source Bluetooth device by saying, “Okay Google, disconnect” or “Hey Google, disconnect.” Google Home Mini allows you to unpair your speaker from the source by either issuing these voice commands to it, or by going into the Bluetooth settings on your source device, and breaking the connection from there. 2019-04-15: Shortened post URL and added tags.